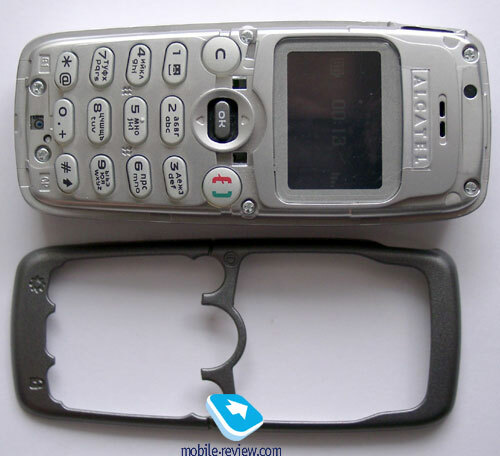 Alcatel decided to follow the steps of other phone producers and presented two models at once. First one is a low-end phone OT331, and second one is our tonight's star of the show - Alcatel OT 332. At first glance the only difference between these two phones is the display. But there are few slight software differences as well. This review is similar to 331's, but there are few changes as well. Display. This phone has color display that can show up to 4096 colors, the picture looks quite nice. Comparing to Siemens phones, it has better color balance and is brighter and information can be read easily. 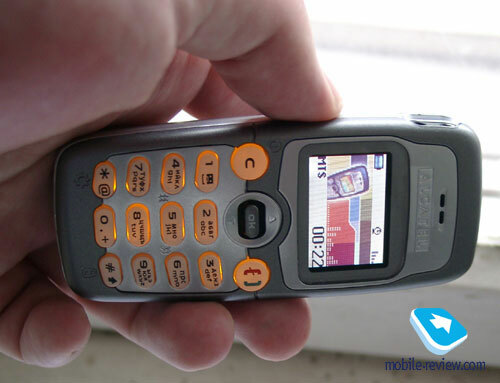 The screen resolution is 96x65 pixels allowing the phone to display up to 4 text lines. While surfing most of the menu only 3 lines are really used as text lines, the last one is used for service needs. Special firmwire will be released for several countries and operators enabling 6 text lines instead of 4. 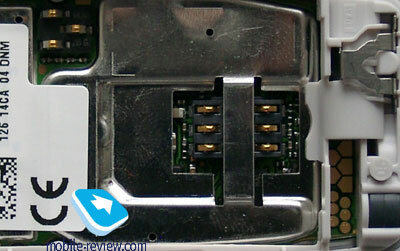 The joystick is located right under the screen, it is not very tight, but has no backlash but on the whole it is fine. With its help you can list vertical lists, it also reacts to presses. Call and End Call buttons are combined into one. The keypad is made of rubber, keys are average sized and are located quite near to each other however no problems were encountered. Backlight is orange, it's uneven, due to font's size, and it's very hard to read what letters are located on each button. In case the keyboard doesn't have second line for local symbols, then it becomes possible to read, but not in all conditions. Hands-free and charging port is located on the left side of the phone. Antenna plug is located on the back. The battery is located behind the back cover. Alcatel decided to ship the phone with lithium-polymeric 600 mAh battery. The producer claims that the phone will work for 210 hours in stand by mode, and up to 3 hours during talk. We tested the phone in Moscow, it managed to work for about two days in case of one hour talking. If you use the phone less intensively it will work for about 3-4 days. Full charging is slightly more than 1.5 hours. Nothing special here, Alcatel's typical interface. In order to access the menu from stand by mode you'll have to press the navigation key, "Messages" can be accessed by pressing the navigation key up, and phonebook - down. The menu doesn't support shortcut number navigation. Phonebook. Phone can save up to 250 numbers and you can add up to three numbers for each contact. To call a phonebook entry - just press Call key, once there is more than one number stored for this entry, you will be able to choose which number to dial. All entries can be sorted into three categories: Business, Private and Others. You can define special ring tones for every group, and even for numbers that don't belong to any group. Messages. Set of pictures for messages got updated. By the way, you can use these images for the display's desktop. A few message templates are included. One interesting option is the ability to send one message to several people at once. (gropu messaging). EMS is also supported. WAP. Standard wap browser, nothing special. Ringtones. Phone has 35 pre-installed melodies, besides you can create two of your own. You can also store a ring tone recorded by dictaphone. Even though the ringtones are polyphonic, they sound rather crude. On the other hand, they are loud so you wont miss an important call. Options for choosing type of call are the following: only sound, only vibrating alert or mixed (phone starts vibrating a few times, and only then the ringtone turns on). My Settings. Use this menu item for choosing a background image during stand by mode, setting up a melody and menu theme. Game. Only one game is installed, 'Puzzle'. And you can't download new ones. Alarm Clock. The Alarm Clock feature, which as well as other notifications, can work even if the phone is turned off. The Alarm Clock itself is very simple: set the time, and that's it. You can also choose any melody to use for the Alarm, as well as with the organiser (up to 5 events) and the Birthday Reminder (up to 5 dates). You can set the number of reoccurrences in the Organiser. A calculator and currency converter are also included. Reception quality isn't surprising; the phone works fine around town and out in the village. During stand by mode the battery and network indicators are displayed. The color display is not very big, but its specifications are good enough for the low-end phone. Polyphonic ring tones sound a bit crude and the volume level is average. The vibration alert is slightly better than average; you can feel it anywhere if you have the phone on you. Since the phone costs about $100 it will be rather popular among youth around Europe.